Deputy Prime Minister and Minister of Foreign Affairs Kudret Özersay said that the UN peacekeeping mission is no longer needed in Cyprus and that it should be turned into a civilian mission. Ozersay travelled to New York on January 7 to express the TRNC’s views to the UN and members of the Security Council, where the issue is expected to be discussed by the end of January. Özersay said that the functions, powers and number of UN peacekeeping troops on the island need to be revised. Underlining that the UN Peacekeeping Force has become the symbol of status quo in Cyprus, Özersay said that the presence of approximately 800 UN forces on the island was costly. Özersay continued: “We believe that there is no need for a military peacekeeping operation that costs nearly $22-23 million per year,” he said, adding that $54 million is expected to be spent for the UN presence on the island in 2019. However if it is turned into a civilian mission the cost will be half and the same duties which are observation and reporting will be fulfilled. The Minister said that there is a general opinion in the UN that the functions, powers and number of UN peacekeeping troops on the island need to be revised, even if their mandate is extended in February. 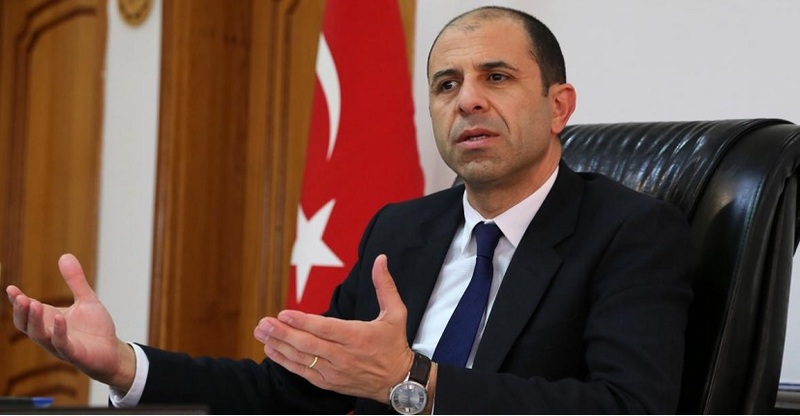 Özersay stressed the importance of energy companies reminding the Greek Cypriot Administration that in order to pass to the further stage of drilling activities, the Turkish Cypriot side’s approval should be received. “At least, all these problems and risks can be removed if both sides start to cooperate on the issue of natural gas. A serious financial responsibility will appear in terms of the companies. If the companies continue their activities without receiving the approval of the Turkish Cypriot side, the issue of responsibility will be brought to the agenda. There are disputed zones in the region. Turkey has put forth its stance clearly that no drilling activity will be allowed. If the issue is brought to the agenda, the companies can lose money, time and have financial problems. Even tension could arise in the region” Özersay added. Noting that the companies can start a dialogue between the two sides, Özersay said that the two sides can discuss the energy issue. Mentioning the natural gas exploration activities of the Turkish Petroleum Corporation in the Mediterranean, Özersay said that the Greek Cypriot side is trying to create a wrong perception as if Turkey conducts natural gas exploration activities in Cyprus. “We do not have a common vision. I don’t blame anyone but there is a reality that the Greek Cypriot side is not willing to share the administration and wealth with us. If you do not want to share governance and wealth you cannot make a federal partnership,” he said, adding that cooperation in energy, fighting terrorism, black money laundering and human trafficking could lead to interdependency between the two sides and ultimately lead to a comprehensive solution to the dispute.